all are of the dust, and all turn to dust again. 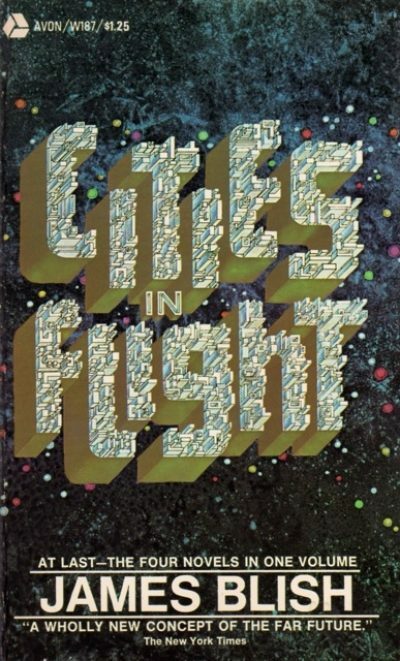 1970’s Cities in Flight collects revised editions of James Blish’s four Cities in Flight novels, They Shall Have Stars (1956), A Life for the Stars (1962), Earthman, Come Home (1955), and The Triumph of Time (1958), along with Richard D. Mullen’s essay, The Earthmanist Culture. The four novels document the Decline of the West, followed by the eventual rise and inevitable fall of its successor, the Earthmanists. It all begins on Jupiter in the far-off year 2013. Locked in struggle with the Soviets, the West has become a security state. Its defensive measures are making it more like its foe. Either the West will be conquered or it will become indistinguishable from its foe. The West is doomed. Desperate to save the spirit of the West, if not the reality, Senator Bliss Wagoner turns to the sort of blue sky research only governments can afford. Perhaps the Bridge on Jupiter is the answer; perhaps humans can escape Earth and its heavy-handed Bureaucratic State. The West and the USA seem to be pretty much interchangeable here. While the Soviets are an unstoppable juggernaut just off stage, the true opponent here is historical inevitability, as manifested in the form of Joe McCarthy stand-in MacHinery. Just as steamboat time means someone will take advantage of existing technology to create a functioning steam engine, so too does Caesarism time mean someone will take advantage of the existing social conditions to set themselves up as demagogue. Of course, Blish is playing here with a toy version of Oswald Spengler’s historical model. There’s no particular reason to think it is any more realistic than the Spindizzy, Blish’s FTL 1 drive. Rediscovered centuries after the fall of the West, gravity-controlling Spindizzies give humanity the stars again, dooming the Bureaucratic State as a side effect. Even with the State gone, nothing could be done to revive the stagnant Terrestrial economy. The Spindizzies could offer hope: entire cities can lift off the Earth and head into deep space, traveling from world to world in search of work. Sixteen-year-old Chris deFord didn’t mean to go Okie. He was just in the wrong place at the wrong time when Scranton decided to abandon Earth for the stars. Traded away to New York, it’s up to Chris to prove himself, to win immortality and high office or be consigned to a short life as a passenger. Blish viewed the Soviets as steadfastly Earthbound, incapable of adopting crewed starflight. In fact, the Soviets didn’t do so badly where crewed space flight was concerned. Whatever the essential features of the West were supposed to be, they didn’t include anything like egalitarianism or democracy. Scranton is ruled by a two-fisted boss; New York’s mayor seems to be answerable only to the City Fathers, powerful computers whose abilities seem to be determined by whatever the plot requires at the moment. Access to life-extending drugs is strictly controlled and has been for some time (which must make the interstellar wandering interesting for the mayfly passengers, since New York’s cruising speed isn’t that much faster than the speed of light, except when it is). This is Blish in Juvenile Adventure Book mode, so things go pretty well for the protagonist. I am afraid the interval between this novel and the next one does not go quite as well for deFord, which is why he does not show up in the next two books. Spindizzies have the rather convenient property that they work better the larger the mass they are trying to move. This is why whole cities can up stakes and head to the stars. The process of lifting a city off a planet seems pretty spectacular. I wonder what the long-term effects of carving thousands of several kilometer-deep holes in the crust are? Are Earth’s economic troubles at all due to multiple extinction-level-events? Under the … wise may be the wrong word… crafty guidance of Mayor Amalfi, New York undertakes a series of contracts, each of which comes with its own potentially city-dooming complications. But will even Amalfi’s cunning save the city when the galactic economy collapses? The specific crisis that kills the economy is that someone, somewhere, greatly increased the supply of germanium, the metal to which the government has pinned its currency. Whoops. As Blish explicitly acknowledges, there wasn’t anything special or particularly valuable about germanium, except that everyone agreed to treat it as far more precious than its utility justified. Or they did until the illusion of value was erased. As previously mentioned, the bigger the payload, the more efficient the Spindizzies’ effect. For some reason, dirigible planets don’t seem to have caught on, and as far as I tell nobody ever tries to strap a Spindizzy onto a stellar system. Having escaped outstanding charges (charges that range from interstellar hooliganism to outright mass murder) by fleeing to the comparative safety of the Magellanic Clouds, the inhabitants of New York are faced with an unfamiliar challenge: how to adapt to the end of the Okie way of life. How can they adapt to a sedentary lifestyle when all they have known for centuries is endless nomadism? But kindly nature provides a final solution…. To carry on from where my editor left off, eugenics hung on a lot later than people may realize. It wasn’t until the 1970s that Canadian provinces stopped sterilizing people on eugenic grounds. The practice hung until at least the 1980s in the US and arguably persists to this day. Perhaps having noticed that merely tossing his protagonist off a cliff didn’t save Arthur Conan Doyle from his most famous series, Blish not only has Earthmanist culture conquered by the incomprehensible Web of Hercules, he takes further steps to make more stories in this setting very unlikely. That said, there are quotations from a history written after the events of this book. How that was possible is not at all clear. An entertaining little essay about the series and the models Blish used. The idea of literal cities in literal flight is certainly a grand one, although I should warn you no such cities appear in the first novel (which I found to be something of a slog). The second novel is a straightforward juvenile, not a form for which Blish was particularly well known 2. The grand scale of the setting is at war with the pedestrian use to which Blish puts it. The general effect is further hindered by Blish’s dry, barely-better-than-workmanlike prose. Also by the repellent political values popping up here and there 3. Perhaps your mileage will vary. In that case, Cities in Flight is available here. 2: If any of you annoy me enough, I will review two late Blish juvies, of such dreadfulness that it is impossible to tell which is more dreadful. Many will know what it is to be roasted in the depths of the sloar that day, I can tell you!